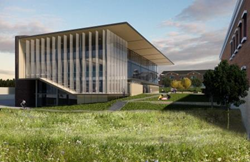 Kansas City University of Medicine and Biosciences will open a new Center for Medical Education Innovation that will utilize the latest evolving technology to give medical students life-like experience early in their educational curriculum. This new facility will transform the curriculum for medical education and how medical and health sciences students are educated- Marc B. Hahn, DO, president and CEO of KCU. 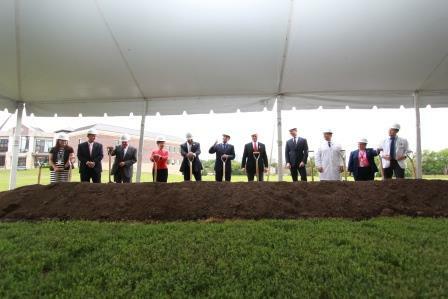 Kansas City University of Medicine and Biosciences (KCU), one of the top 10 educators of physicians in the U.S., broke ground on a new state-of-the-art Center for Medical Education Innovation (CMEI) June 4, 2018, on the campus of KCU. The 56,000-square-foot facility will provide the latest in virtual reality, haptic technology and simulated clinical experiences for educating the next generation of physicians and health sciences professionals. The $33 million facility will be built on four levels and will feature multifunctional “future-proof” space that will allow for changes and emerging technologies in the coming years. It will also serve as a resource for students and health care professionals throughout the region, offering opportunities for continuing medical education, inter-professional education and active research in academic collaboration. The building will feature standardized patient rooms (where trained actors play the role of patients), high-fidelity simulation rooms (where medical robots display a variety of disease processes), a skills simulation deck that utilizes the latest in virtual reality and haptic technologies, and a simulation command center. It will also include nearly 13,000 square feet of classroom space and an advanced physical diagnosis and Osteopathic Manipulation Medicine. The CMEI is the latest of several innovative initiatives the University has embarked upon noted John P. Smith, DO, Chairman of the KCU Board of Trustees. JE Dunn will serve as the general contractor for construction. Design of the facility was led by the team of Helix Architecture and Design and CO Architects. Click here for a virtual tour of the facility. The construction of the Center for Medical Education Innovation is possible in part because of a $1 million challenge grant from the J.E. and L.E. Mabee Foundation, a $1 million grant from William T. Kemper Foundation, and lead gifts from Sunderland Foundation, J. E. Dunn Construction Company, Victor E. Speas Foundation, Bank of America, N.A., Trustee, and Jack and Glenna Wylie Foundation. KCU opened a second medical school in Joplin, Missouri, in 2017 to help address the growing need for primary care physicians in the region’s rural communities. The university also added a doctoral program in clinical psychology in 2017 to meet the growing demand for behavioral health providers in the region.